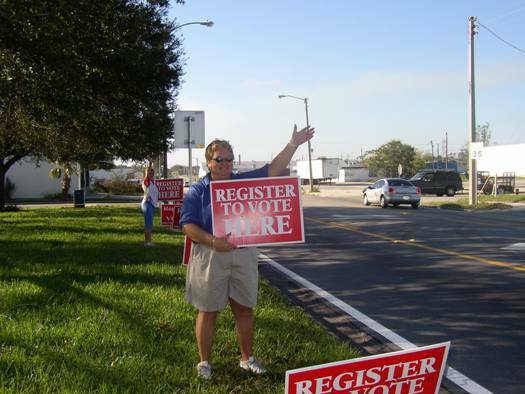 THE OUTREACH DEPARTMENT'S GOALS ARE TO RAISE VOTER AWARENESS AMONG RESIDENTS OF POLK COUNTY, TO PROVIDE OPPORTUNITIES FOR THE PUBLIC TO LEARN ABOUT THE ELECTIONS PROCESS, AND TO PROVIDE CONVENIENCE WHEN REGISTERING TO VOTE. Tour Our Operations Center - Our office is comprised of five departments with each one playing an important role in the success of our office. Come see how your Elections Office operates and give our experts an opportunity to answer your questions. Request a Speaker - Pick from one of the popular topics below or help us customize a presentation for your audience. Voting Trends - Get the inside scoop on Polk County Elections: How has the voting process changed over the years, who votes and who doesn't, and plenty more statistics. Why is Voting Important? - Let us show your group how our elected officials impact our lives. During this presentation we make each person aware of the power of their vote. Countdown to Election Day - Have a member of our staff explain the "3 Easy Ways to Vote" and answer questions concerning the ballot. We can also bring our voting equipment and demonstrate what to expect at the polls. C.A.R.E. (Citizens Acting Responsibly Everyday) - This is an interactive presentation which teaches elementary and middle school students what it means to be a good citizen and why it is important for students to C.A.R.E. about voting. Invite the Elections Office to your event - We can provide a variety of voter services including: voter registration, updating name, address, or party affiliation changes, and requesting a vote by mail ballot. This is a convenient way to offer a needed service to your group. THE SUPERVISOR OF ELECTIONS PROVIDES INFORMATION FOR BOTH STUDENTS AND TEACHERS TO USE IN DEVELOPING A BETTER UNDERSTANDING OF THE ELECTORAL PROCESS. Learn more about your elected officials like their name, position, and terms served. You can also write letters to them using their email address. Click here to learn how you can better serve your community through various community service activities. Browse through our list of lesson plans that will assist you in teaching your class more about the electoral system. To learn how you can contribute to your community through various outreach projects such as registration drives and voting in honor of a vet. Explore these websites for more exciting information as well as games that will teach your students more about the electoral process. IF YOU WOULD LIKE TO REQUEST ANY OF THE ABOVE SERVICES, PLEASE FILL OUT THE ONLINE COMMUNITY INVOLVEMENT FORM AND YOU WILL BE CONTACTED BY ONE OF OUR STAFF MEMBERS. IF YOU WOULD LIKE FURTHER INFORMATION PLEASE CONTACT OUR OUTREACH DEPARTMENT AT OUTREACH@POLKELECTIONS.COM OR CALL 863-534-5888.